Between 1994 and 2001, the gallery held a total of 73 one-man and group exhibitions. 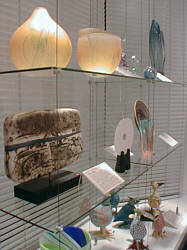 This page links to four of the last exhibitions to be presented. At the bottom of the page you will find a link to the Gallery's 25th Anniversary Exhibition, held in 1999. Please click on the exhibition titles to see full details.